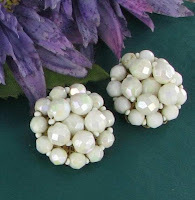 Since the new month is about to start, I'll be discussing the birthstone for June - the pearl. And with the newest run of June weddings coming up, how apt is it that this traditional wedding accessory is also the birthstone for the month? 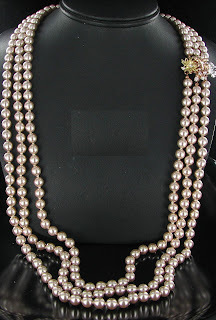 Pearls are considered the modern gemstone for those born in the month of June. Other charts also show the moonstone and alexandrite, but the pearl is the main stone associated with June, so I will discuss it for this series. The meaning of pearl is gem of the sea. Pearl is often used as a metaphor for something rare, fine, and admirable. It has been said that the pearl is a symbol of femininity, preciousness, and purity of heart. The pearls can be of all types - freshwater, saltwater, faux or cultured. Most pearls sold today have been cultured, which means that some sort of material has been inserted into the mollusk to generate the pearl. Most people think of cream or white when they think pearls, but all sorts of colors are available from gray, through to yellow pink and other pretty colors. A genuine pearl formed in nature takes many years to produce and only a small percentage of mollusks that do produce pearls have the final product the size and shape needed for jewelry. As with all gemstones, a pearl has metaphysical and folklore tales attached to it. The ancient Greeks believed that pearls were the hardened tears of joy that the Love Goddess shook from her eyes as she was born from the sea. Old Arabian legends say that pearls were made when oysters were lured from the depths of the ocean by the moon and then swallowed moonlit dew drops. New age thinkers believe that pearls treat digestive disorders and relieve conditions of bloating as well as increase fertility and eases in the pain of childbirth. Today's vintage jewelry word is marquis. The correct pronunciation of the word is "Mar-KEYS" not "Mar-KEY" which is commonly heard. The cut is named for the Marquis de Pompadour - mistress of King Louis XV. A marquis cut stone or rhinestone is an elongated, faceted oval cut, which tapers to a point. It is similar to a navette cut, but slightly more rounded at the tips and a wider at the center edges. 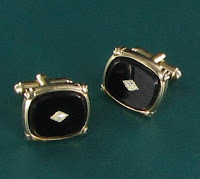 The words marquis and navette are often used interchangeably but they are two quite different styles of stones. Marquis cuts are used in all sorts of stones from rhinestones through gemstones and to Diamonds. This type of cut is wonderful because the shape of it makes the stone look larger than it actually is, so it's a popular choice for diamond rings. One of the hottest fashion trends for summer is the color yellow. So vibrant and fresh, it compliments so many other colors. 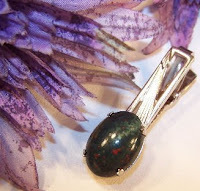 I had a look through my stores to see what I have in this popular color and found quite a few things to feature today. 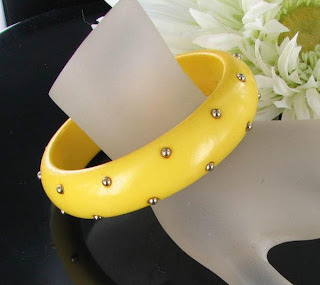 The most recent addition is this bright yellow retro lucite bangle bracelet. It's a rich buttercup yellow and is available at my ebay store for only $10.99. I had several of these and they are selling quickly at this price so hurry or they will be all gone! Here are some other pretty yellow jewelry choices. You can click the pictures to get more details and prices of the individual items. 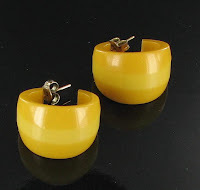 The first pair of earrings are a lovely, yummy butterscotch yellow bakelite design! These lovely pieces are available at prices from $10.00 to $27. 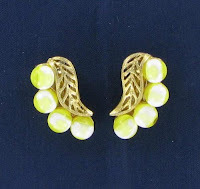 Hurry in to get your hot yellow jewelry piece today. Interested in a piece of jewelry that will show your own unique style? Think charm necklaces. Charms are not just for bracelets any longer. The latest rage is large pendant style charms on big chain necklaces. I've just purchased a large inventory of these fabulous charm necklaces. Each necklace features a large single link goldtone chain with a lobster claw clasp (signed LCI - Liz Claiborne). The necklaces have a wondeful festoon bib design and are just loaded with big chunky charms in a wide variety of themes. 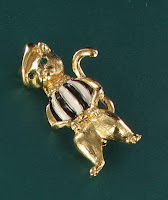 Some of the charms include figurals such as cats, dogs, foxes, dolphins, owls and eagles. Others are religious in nature with crosses or Buddha figures. Some are novelty such as carousel horses, stars, etc. Some even have a Christmas design with Christmas stockings and Christmas trees. 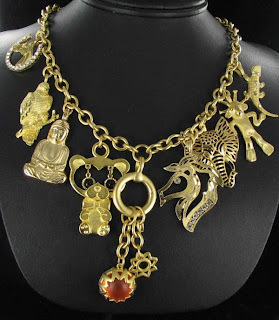 The necklace featured here has horses, teddy bears, buddha, alien figure and more. It's so chunky and retro looking and will really make a statement. These are not tiny charms such as those found on charm bracelets. Many of these charms are 1 1/2" or more in size. I've got four of them listed now, but I'll be listing the whole collection in my ebay store Carolina Collections Vintage Jewelry this week. But don't delay. At only $29.99 and best offer, they won't last long! Nolan Miller is a renowned television costumer designer who is best know for his work on the long running 1980s TV series Dynasty. He has collaborated with Aaron Spelling on many television projects. The creations he designed for Dynasty became so popular that he started his own line of women's apparel called "They Dynasty Collection." This was a haute couture line worn by Joan Collins, Linda Evans and Diahann Carroll. I'm not sure whether this necklace is part of the Dynasty series, but it certainly deserves to be so. It is just fabulous and I can really imagine Linda Evans wearing it. The necklace features three exquisite strands of lustrous hand knotted pale pink glass pearls. 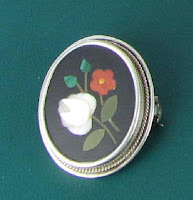 It has a fabulous flower and rhinestone box clasp which is just stunning in a three metal combination. 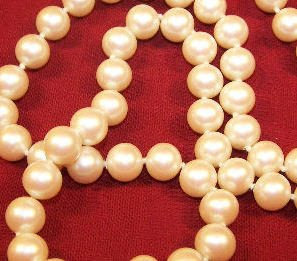 The strands of the pearls are opera lengths of 34", 36" and 38" and the necklace will slip over the head without undoing the clasp. Remarkable condition - it appears to never have been worn. 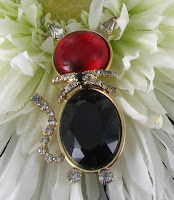 This fabulous find of the week is available at my Ruby Lane Finishing Touch Vintage Jewelry shop for only $135. You will feel like an actress on Dynasty wearing it - I promise you! It's almost time for this year's batch of June brides to get ready for their big day. 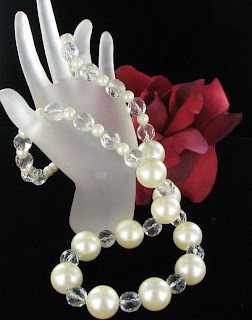 When one thinks of jewelry for brides, pearls often come to mind. There are lots of choices in the vintage jewelry line. It could be part of the "something borrowed" phrase, if your mother or grandmother has a lovely set of pearls, or it could be purchased now from our extensive range of pearl jewelry. 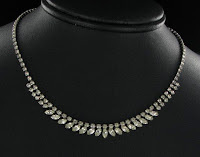 This fabulous pearl necklace also features prism cut crystal beads and is strung on silver chain. It would look stunning with so many different styles of wedding gowns. 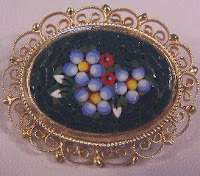 It's available in my Finishing Touch Vintage Jewelry store at Ruby Lane for only $40. But do you need to only think pearls? 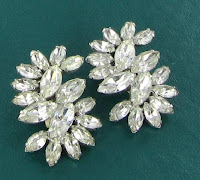 How about fabulous white ice diamante rhinestones for your special day? 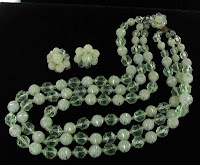 Vintage jewelry designers from the 1950s made so many fabulous pins, bracelets, earrings and necklaces in what are sometimes known as "white rhinestones." 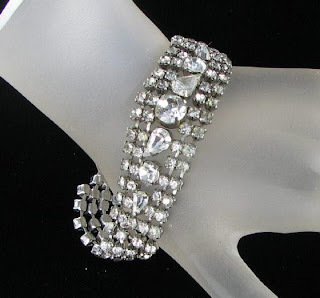 This fabulous rhinestone bracelet would be just the thing for any summer wedding. 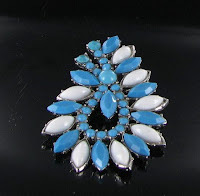 It's available at my Vintage Jewelry Lane store for only $45.99. And don't forget crystals. 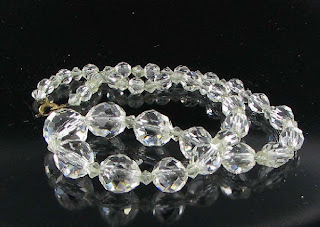 There are so many lovely necklace and earring designs from this period, and they come in either cut glass or aurora borealis crystals to really sparkle and shine. 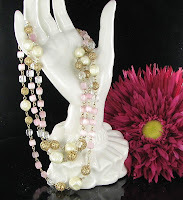 I have three crystal necklace designs in my Ruby Lane shop - one of each type of glass and one with faux pearls shown above at the beginning of this blog. Here is a look at the cut glass necklace. Imagine how lovely it would look at your neckline. For bridesmaids, or flower girl gifts, vintage jewelry will make unique and special gifts designed with them in mind. Our shops have design for all tastes and budgets. All of these styles would be wonderful for your wedding day and would be fantastic keepsakes to keep for your own daughter when her wedding occurs in years to come. Hematite and Lodestone - Which is magnetic? Both of these black or very dark gray minerals look quite similar. They are shiny, similar in color and both made of iron oxide - magnetite. Both have healing properties, although the magnetic effect is associated with lodestone. I will discuss each mineral separately which should give you a good overview of the differences and similarities. Lodestone is magnetic when found in nature. It was commonly used in the manufacture of compasses, because of these magnetic properties. Hematite, on the other hand, is not magnetic by nature. What we have come to think of as magnetic hematite is actually a synthetic material called synthetic Hematite or hemalyke. This synthetic material is created with magnetism - thus the confusion between the two types of minerals. Both minerals have healing and mystical properties. For more information on the two minerals, please visit the hematite article in the resource library at Vintage Jewelry Lane. This blog post is another in my series about choosing jewelry suitable for individual star signs. Today's astrological sign is Gemini, which is the sign for those born between May 21-June 20. The sign is depicted as Twins or a face with two heads. Those born under the sign of the twins are said to have gained the reputation of being the great talkers of the Zodiac. They are thought to be versatile and adapt to changes easily. They are youthful and energetic and this makes them a delight to be around. On the negative side, a Gemini can have moods that change from moment to moment. Sometimes tjey will argue just for the sake of arguing, and can be somewhat fickle at times. Of course, you can always just pick up some jewelry that has the Gemini logo on it, but how about being a bit more creative and using these facts to choose a "Gemini inspired" gift? 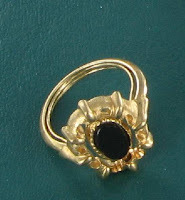 One thing that pops to mind with me is the fact that they are the sign of the twins, so reversible jewelry might inspire them, such as a ring which has a setting that revolves like this swivel ring with one side black and one white. It would certainly show the complexity of the character of this star sign well. 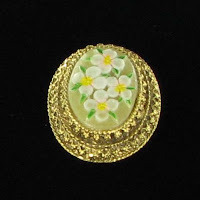 This pretty glass swivel ring is available at Vintage Jewelry Lane for only $11.25. 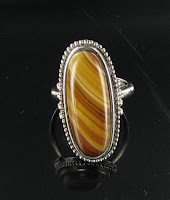 The fact that agate is associated with Geminis made this gemstone a logical choice. 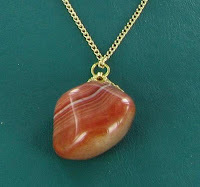 Here is some lovely agate jewelry that is available in my stores. There are even some in the gemini favorite colors, so you would get two traits for the price of one. The styles are available for prices between $9.99 and $13.25 . Just click the pictures to go to the listing pages. And if you would like to incorporate the lucky numbers of 3 and 4 into your gift, nothing will fit the bill better than a 3 or 4 multi strand necklace. Here a couple. 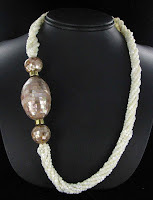 I have many more multi strand necklaces in all my shops. The set is $28 and the pink glass necklace is $24. And if you want to use the flowers as part of your gift, I have a lovely orchid demi parure available at Carolina Collections Vintage Jewelry for only $11.99. Now go wow your Gemini friend with the perfect gift! 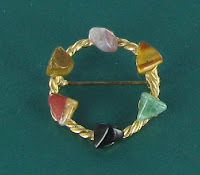 Today's vintage jewelry word is tessera. The plural of tessera. (pronounced tess-er-aye) A tessera is an individual tile used in a mosaic, usually in the form of a cube. Originally, the tiles used were small, naturally colored pebbles, but eventually special tiles were made to use in the making of pictures or designs on mosaics of all types. 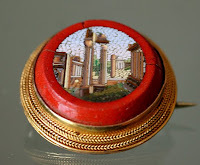 In vintage jewelry, this is a word used for small glass tiles which are combined to make intricate designs in Micro Mosaic, Mosaic and Pietra Dura Jewelry, which were very popular with Italian artisans. Marble or limestone pieces were cut into small cubes that were then arranged into the mosaic design. Much later, the tesserae were made from colored glass. This is the type of tiles that we have come to know and recognize when used in Italian micro mosaic jewelry. The size of the tiles determines what the mosaic style is called. They range from micro mosaics, where the smallest tesserae were used, through medium sized tiles, which were used in mosaic jewelry, through to Pietra Dura, where the largest tiles were used. The following are examples of the various styles of mosaic jewelry and shows the differences between the tesserae. You can click on the pictures to get a better idea of the size of the tiles. 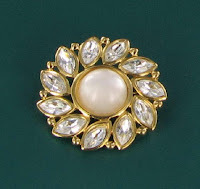 For more words of the week, you can go to our Words of the Week Archives in the resource library on Vintage Jewelry Lane. I used to be a cat enthusiast. When my husband and I lived in Australia years ago, we had cats as pets for years. My favorites were the Siamese - we had several of them over the 15 years we lived there. Since returning to the US, we seem to have acquired a fondness for German Shepherd dogs, but that's another story for a later date. 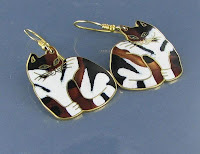 Since I began selling vintage jewelry online over a decade ago, I have come to discover that one of the most popular thematic jewelry line is that featuring cats. These items just seem to fly off the shelves, particularly if they are unusual designs. 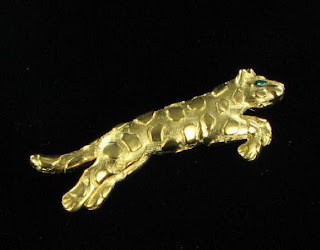 Sometimes, the designs are wild cats such as this cute Trifari leaping leopard pin featured here, and other times, they are various designs of house cats. All seem to be widely popular. 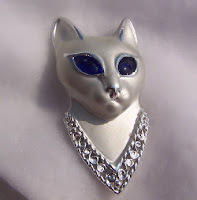 Most vintage jewelry designers had cat designs in their lines, but several vintage jewelry designers are particularly known for lovely feline figurals. Some that come to mind are JJ (Jonette Jewelry), AJC, AJMC, Danecraft, and others. 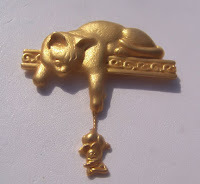 Trifari, Art, Warner and Coro also had several designs of cats. Have a look at these cute kittens to see if something makes you purr with delight. Which one is the cat's meow for you? 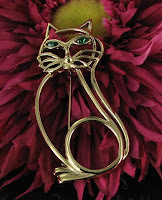 The cat jewelry is all available for sale from one of my online stores. Just click the pictures to go to the item. Prices are $9.99 to $29.99. 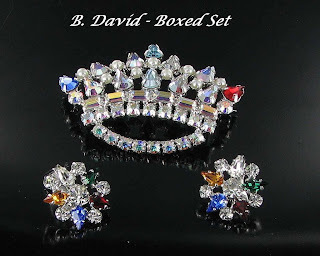 B. David jewelry is known for their stunning rhinestone jewelry, in particular their mother's crown series of brooches. The design is meant to show the story of a mother's life, with each child's simulated birthstone as a jewel in her crown. 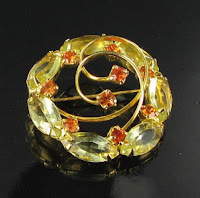 I was fortunate to acquire a complete set of this design in the original B. David box for my new Ruby Lane Shop - Finishing Touch Vintage Jewelry. 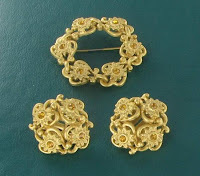 The set features a crown brooch and matching pair of clip back earrings. They are in like new condition, and feature very pretty aurora borealis rhinestones along with multi colored accent rhinestones. The stunning B. David mother's crown set comes with the original gift box and the small gift card which tells the story of the mother's crown. It is available for only $60 with free shipping. If the stones aren't the colors that are appropriate for your mother and you are a crafty type of person, they could be changed for the appropriate colors - the story card tells you which stones are the right ones for each month. Or just wear the set as a lovely demi without the story. The pieces are beautiful in their own right. With spring here and summer around the corner, I thought that today's color should be white. When I was young, there was a "rule" that you should only wear white shoes between Memorial day and Labor day. Fortunately, there is no such rule about white jewelry. It can be worn anytime, but is especially good with summer fashions. 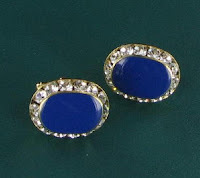 White jewelry can be worn with blue, black and any other dark colors. White can also look very trendy with this summer's hot colors of yellow, and orange. 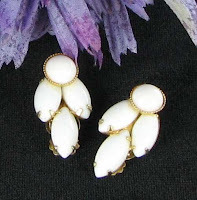 But don't stop there - white jewelry is the perfect accent for any color. 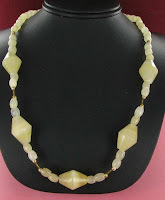 You can look for jewelry in gem stones such as White Agate, moonstone, snow onyx, pearl or mother of pearl, or just pure crystal such as quartz. And don't forget white rhinestones! 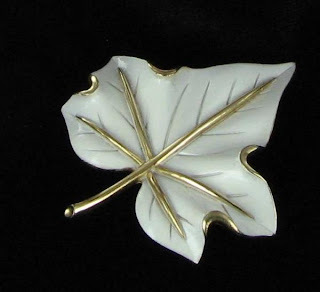 White milk glass is so pure looking, and vintage plastics often used white as a color. And nothing is quite as crisp and fresh as white enamel. It looks just perfect on black. 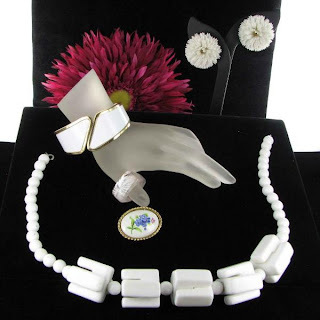 Since pre-historic times, white jewelry has been part of the human fashion business. Why? 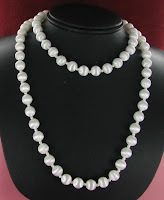 Think of the available materials - jewelry was probably first made from bones and pearls and shells of pearls. So white was it. Check out some of these pretty styles of white jewelry. Which one would accompany your wardrobe best? All of these styles are available in my Carolina Collections Vintage Jewelry store for prices between $9.99 and $24.99. I even have collections of all white jewelry for sale. This pretty collection contains the white featherlite earrings shown above and is available for $24.99 for the whole collection! And remember - you can wear white all year round. No rules to follow. It's almost time for school proms, and the talk is all about what the girls should wear for jewelry. But what about the guys? They like to dress up too. 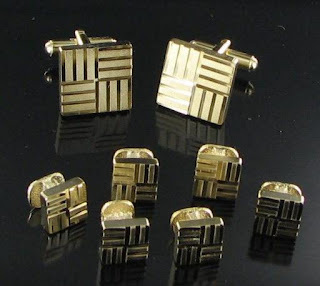 This wonderful set in goldtone metal is perfect for the guy who likes a modernistic look without too much flash. And it even has six Tuxedo shirt studs to complete the look. It's available from my Carolina Collections Vintage Jewelry store for only $18.99. 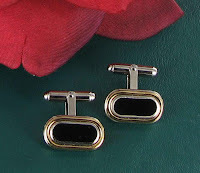 If your guy likes a much more dressy look, then check out the latest in these flashy men's cuff links. 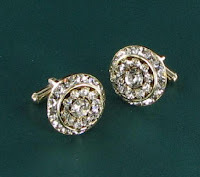 They feature onyx and rhinestones, or channel set rhinestones and some which are just onxy. They will give the perfect look to a simple dress shirt and make your guy really stand out in the crowd. Prices are very reasonable - from $15.99-$29.99. Just click the pictures to go to the item pages for more details.